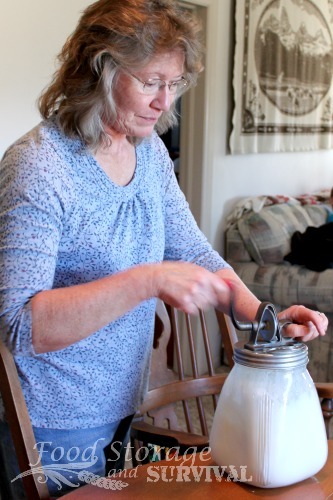 Want to start making your own butter? 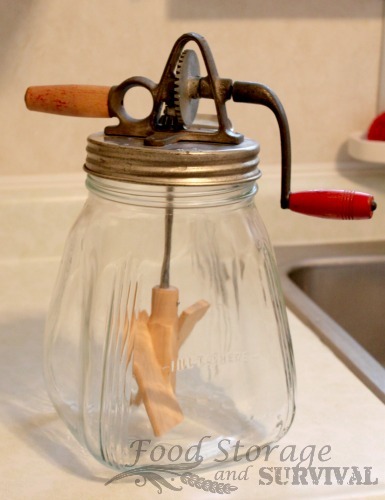 For our Thanksgiving meal this year, we made our own butter using my grandma’s butter churn. It’s probably an antique, but you can get something similar here. The process of making butter is pretty simple, and it’s always a bit like magic when that butter pulls together at the end. Definitely something the kids should witness at least once in their lives! Ready to make your own butter? Cream. This can be fresh from a cow or purchased at the store. You want heavy cream, not half and half. We got ours from a local dairy. Salt. Totally optional, but you’ll need some if you want salted butter. Some way to agitate the cream. We’re using this churn. 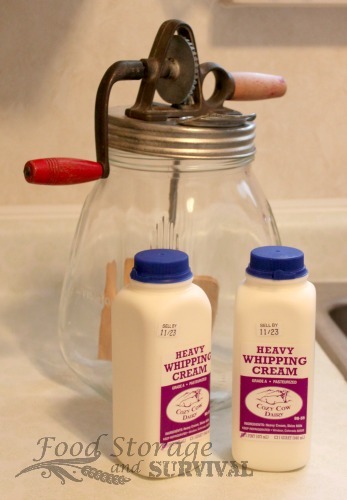 Step 1: Pour the cream into the churn. You only want it about 1/4 to 1/3 full. 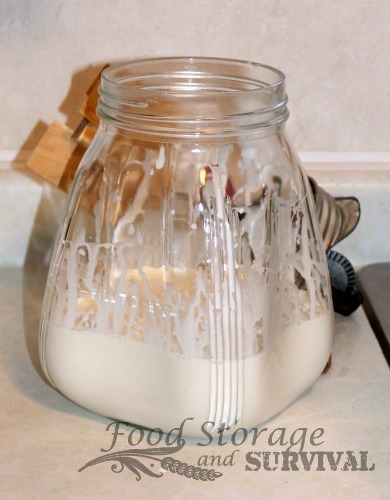 Ours had a fill line marked on the side that would have held 2 quarts (4 pints). We only used 3 pints. 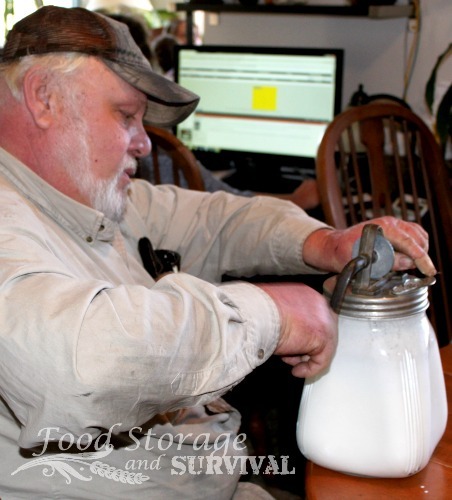 Step 2: Put the lid on securely and start mixing. There’s a reason there’s a handle and thumb hole on the lid of this one! It can get a little squirrelly as you’re mixing. Hire help if you need to. Heck, let everyone have a turn at cranking the handle. It takes a while. Step 3: When the cream started thickening up and sticking to the sides, we opened the churn and pushed it all down to the bottom again. Might not be necessary, but it made me feel better about it all getting mixed up evenly. As it gets thicker, it’s harder to turn the handle. You might need someone else to help hold the whole contraption still for you. 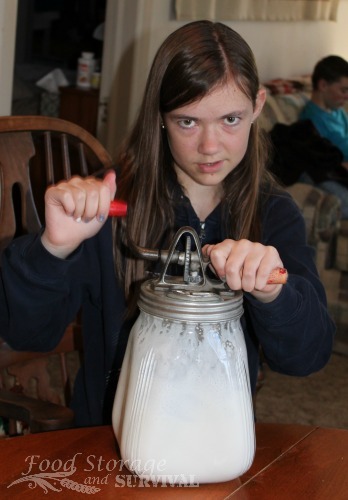 Step 4: Churn on until the magic happens. 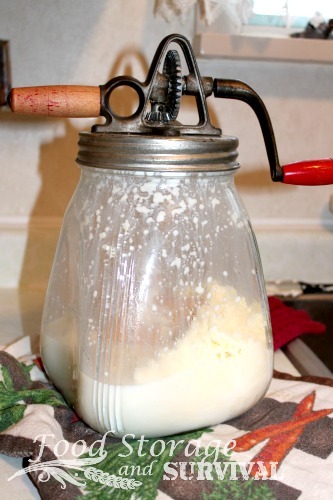 At some point in the churning, the butter will separate from the milky substance that is buttermilk. Stir it around until it gathers into a ball. 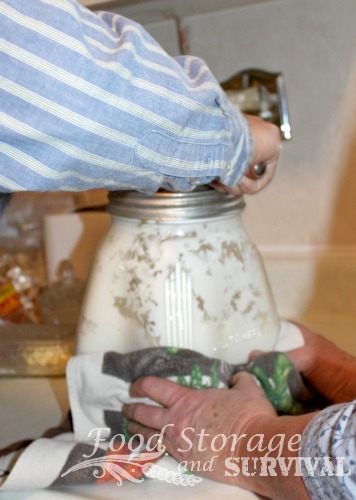 Step 5: Drain the buttermilk off. You can drink this or use it in cooking. Step 6: Rinse and drain the butter blob. Nice cold water, so you don’t start melting it! 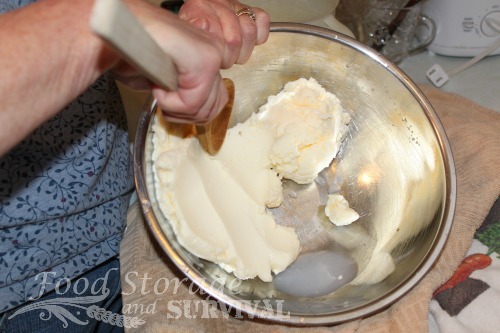 Step 7: Squish the butter against the side of a bowl with a flat spatula or the back of a large mixing spoon. Don’t squish it against the bottom of the bowl. You want any of the buttermilk or rinse water to squish out. See how there’s a puddle collecting at the bottom edge of the bowl? If this gets left in, your butter will spoil quickly. Keep squishing in different directions until you have it all squished out. 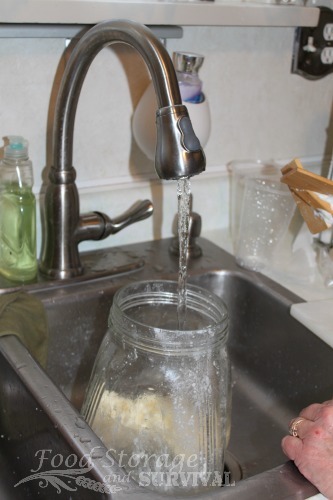 At this point you can rinse your butter again before storing it. Step 8: Optional! Add salt. About 1 tsp. per pound of butter. 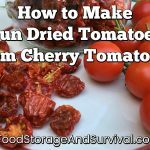 This works out to 1/4 tsp per half cup. Stir the salt thoroughly into the butter. We actually used the Kitchenaid mixer for this part since we were all tired of stirring the butter. 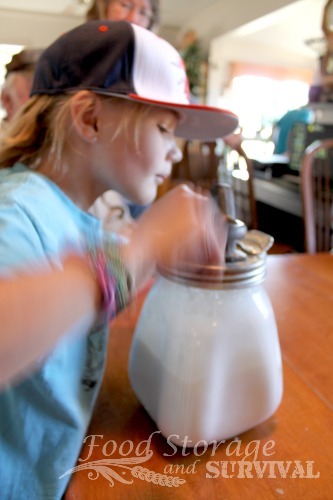 Butter at the store is expensive, but making butter cost even more (we bought cream from a small local dairy for this experiment, so you may be able to make it cheaper than this cost us!) It was, however, an interesting project. 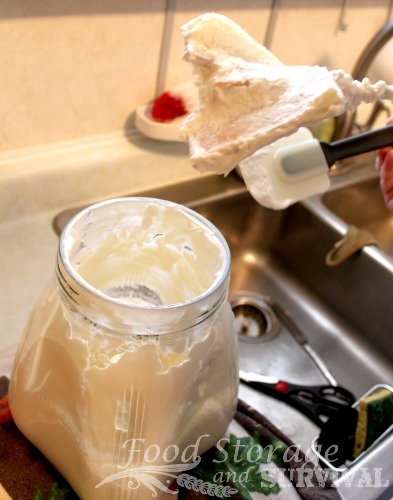 If you have access to cream from a cow, and didn’t have to buy it, this would be a great way to get butter on the table. 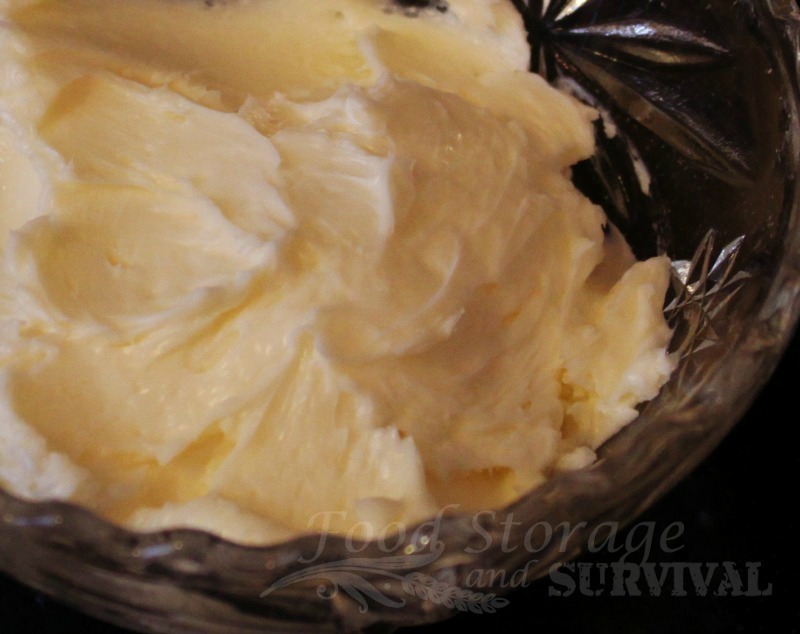 We think fresh homemade butter tastes better than store bought butter. 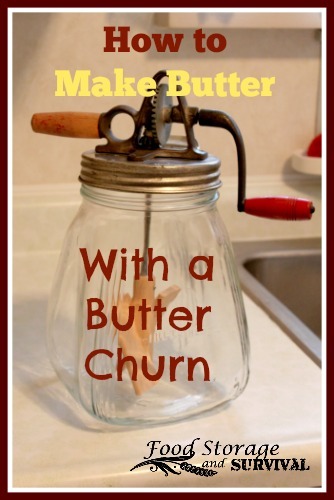 I love you butter churn! I need to find one of those gadgets! Great article, thanks for the step by step photos and instructions!